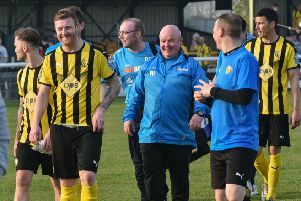 Racing Club Warwick boss Scott Easterlow admitted he had mixed feelings after watching his ten men battle back from 2-0 down to earn a draw against Lichfield City on Saturday. Racers were already trailing 2-0 when Jack Taylor saw red for a reckless challenge in the 19th minute. Sean Kavanagh beats the keeper but his shot was cleared off the line. And despite recent signing Richard Powell reducing the arrears following good work on the wing by Ryan Billington, Lichfield quickly restored their two-goal cushion. However, Luke Church’s goal on the stroke of half-time kept Racers in the game and they looked dangerous every time they broke forward after the interval. A Luke Cole header went agonisingly wide when it looked easier to score and Cole was then denied by a superb stop from the visiting keeper following a delightful free-kick from Alex Price. Tom Cross saved well to prevent Racers slipping 4-2 down and a gritty showing from the hosts was rewarded when Martin Slevin volleyed home from a corner. City’s third 3-3 draw in the space of eight days was then confirmed when Racers substitute Sean Kavanagh’s stabbed shot was kept out on the line by a defender’s knee, with home players and fans appealing in vain for a goal. “You would think playing with ten men for 70 minutes and getting a point after being 2-0 down was a good result,” said Easterlow. “But if I’m honest it feels like two points dropped. We wasted some great chances in the second half to win it and had one cleared off the line. “That being said, you can’t fault the effort and never-say-die attitude of the lads. “We could have collapsed after we had gone behind and a man down but strangely it seemed to kick us into gear. “One lesson we need to learn and learn fast is for whatever reason at the moment it takes us time to get going. “We have got to be into our stride early doors, be on the front foot and let sides know that they are in a game from the first whistle. “I think it’s a measure of how far the club has come in a short amount of time when we’re disappointed with a draw. “We have only lost one game in the last five and that was against the title favourites. Racing Club entertain Uttoxeter Town on Saturday (3pm).